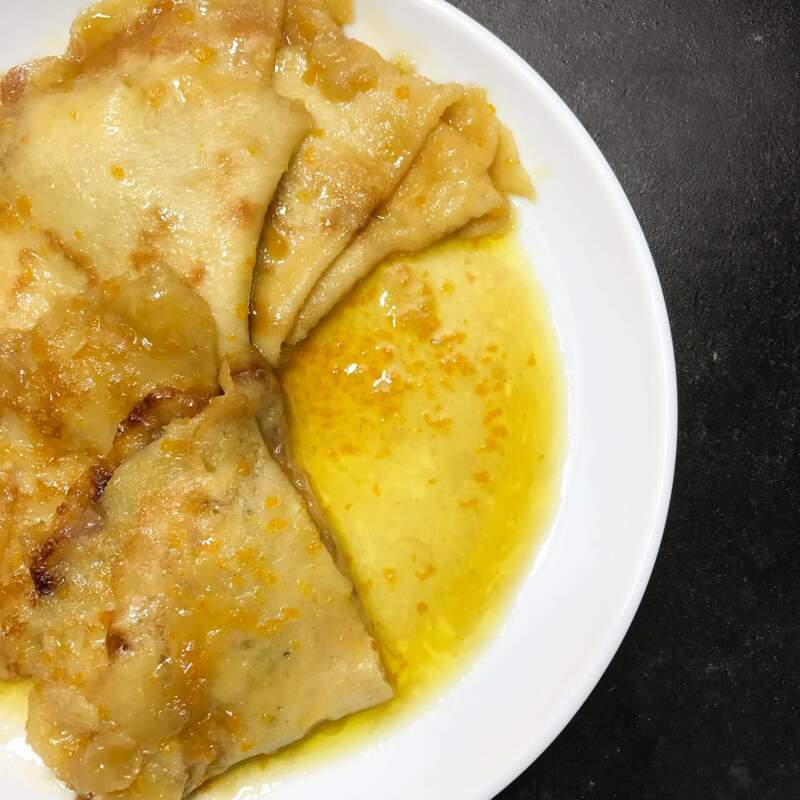 Can you flambe anything more tasty than Crepes Suzette? If so let me know!!! 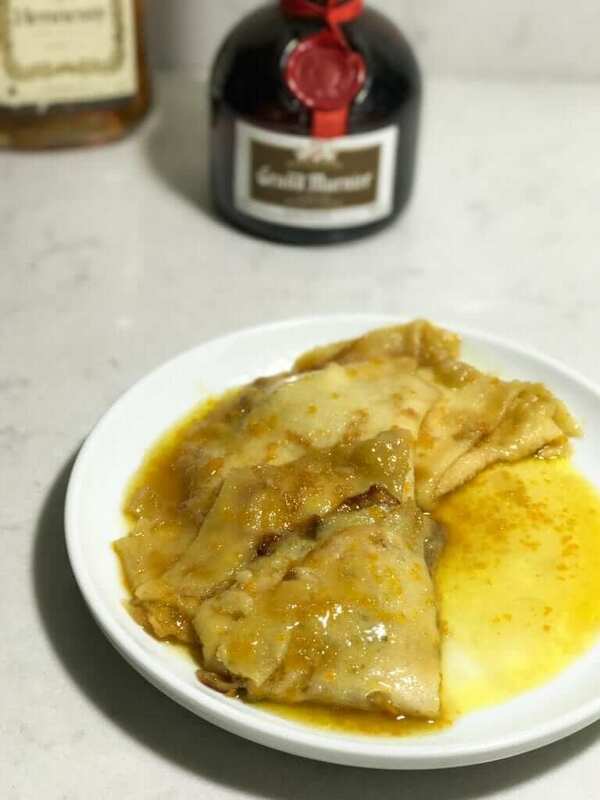 If you haven’t heard of this, Crepes Suzette is a super super rich and delicious French dessert made with lots of butter, several liqueurs, and fresh oranges. I used the recipe from Julia Child’s Mastering the Art of French Cooking, Vol. 1 and made some slight changes toward the end. I used slightly less sugar while increasing the liqueur just before the flambe because I like my crepes a little less sweet and with a bit more of the liqueur flavors showing through. I ate this three days straight with no regrets. It was that good. My favorite part about making these is playing with fire. This is like playing with fireworks, but rather than seeing pretty colors I get to eat the product of the fire. ???? Make sure to watch your precious eyebrows and long hair or you might be smelling burnt hair rather than a lovely boozy and buttery orange aroma. This will be my first post with a cooking demo. The footage is mostly raw with a few cuts here and there and walks you through assembly and flambe!???? Let me know what you think both about the video and the recipe! Use a blender and add the ingredients in the order listed. Blend at high speed for about 1 minute, stop and scrape and blend for 5 seconds more to combine. Refrigerate at least 2 hours, ideally overnight. Add the sugar with orange zest to your food processor and process for one minute. Scrape down if needed. Add in the butter by the tablespoon pieces. Process each for 10-15 seconds until all have been added and the butter is slightly fluffy. Next, gradually add in the orange juice (over 7-8 tiny pours) and pulsing to combine in between additions. Last add the orange liqueur. The butter should still be creamy by this point, if too thick add a little bit of orange juice by the tsp. First you will need to make the crepes, using a cast iron pan or crepe pan, preheat and melt butter. Pour batter to make crepes roughly 1-2mm thick and 5-6 inches diameter. Once lightly browned on the bottom remove and set aside. Once your crepes are ready, take 3-4 crepes and fold into quarters. Using a stainless skillet (or one safe for the flambe), spread on about 3-4 Tbsp of the orange butter. Turn the heat on medium and allow to melt. Tilt the pan and increase the heat back to medium so the flame catches on top. Let the alcohol burn off and once the fire dies out, start spooning the remaining sauce over the crepes. You'll notice the sauce will start to thicken/harden, so work quickly to transfer to a plate and serve! Have a taste to reward yourself and remember... sometimes hard work and prep is totally worth it!! Hi fives all around!! For the orange butter- You want the butter to remain creamy, if you think it's too thick consider adding a tsp. of orange juice to the butter. For the flambe- you could also turn off the stove and use a match or a fireplace lighter, make sure to have at least a 4-5 foot clearance above your flambe pan, since the flame gets big! 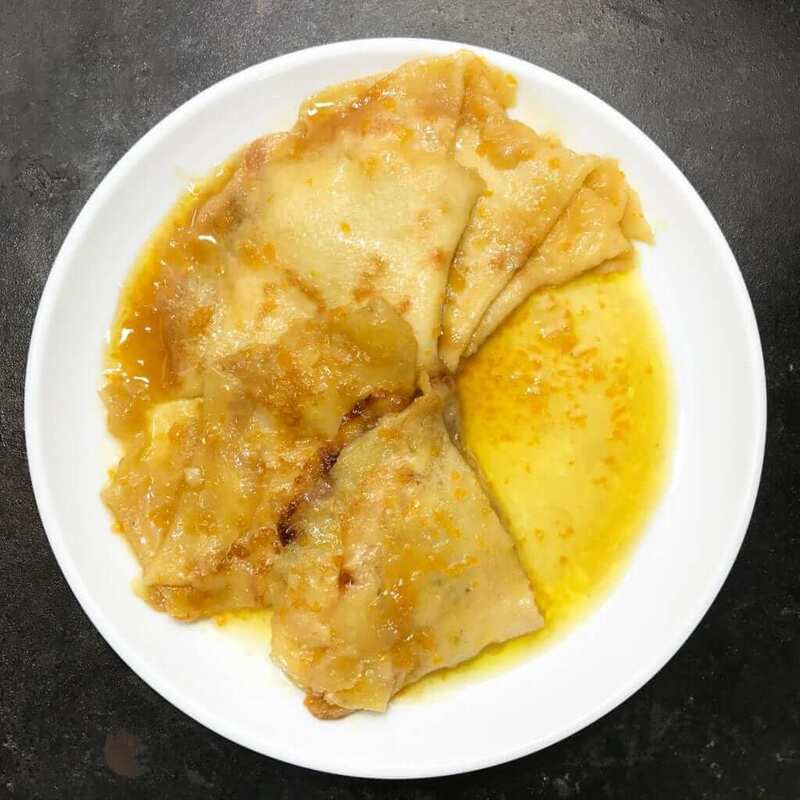 I have tried crepe but Ive never had Crepes Suzette. I am also not a fan of any food with liquor in it, how does it taste like? Ill probably prepare this for my husband and see how it goes. Thanks for sharing this! Yummy! This looks so good! I can’t wait to try this! thank you Mine! have you made anything like this before? Cherries Jubilee with kirsch is another great sweet crepe dish. I don’t flame cause I’d probably set fire to myself or the kitchen. 🙂 And for a more homey dish, have you tried blintzes? I havent but i bookmarked your recipe to try! ???? Thanks Liz this was my first try at making one of her dishes, so far they have exceeded expectations!! I’ve never *intentionally* flambéed anything, but if I were to, buttery crepes would be at the top of my list, they look so indulgent and good. Haah does that mean you accidentally set your food on fire ????????? There have definitely been dish towel incidents *^^* . PS comments worked! thanks for your help!